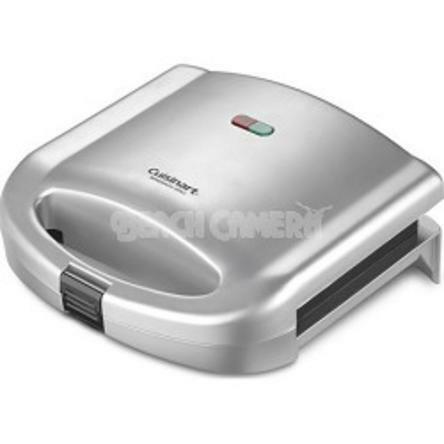 Cuisinart Sandwich Grill Just $19.95! Down From $40.00! You are here: Home / Great Deals / Cuisinart Sandwich Grill Just $19.95! Down From $40.00! Sears has this Cuisinart Sandwich Grill on sale for $19.95 (Reg. $40.00)! The Cuisinart Sandwich Grill does more than lunch. This versatile Cuisinart product also makes omelets and French toast! Designed to grill two items at a time, it is perfect for breakfast, lunch, or light dinners. Dual indicator lights ensure nothing over or undercooks, and nonstick plates eliminate the need for added butter or oil. A lockdown lid guarantees both sides cook evenly, and raised ridges on plates seal in ingredients. When the work is done, the lid lock and cord wrap make storage easy. Features Grills 2 sandwiches, omelets or servings of French toast Lockdown lid positions plates to evenly grill both sides Ready to cook and Ready to eat indicator lights Raised ridges in cooking plates seal edges of bread or omelets to keep ingredients inside Nonstick baking plates wipe clean in seconds Deep pockets Cord storage Limited 3year warranty.